In this illustration of Earth seen from the moon, the lunar body tide creates a lump on the moon's surface. 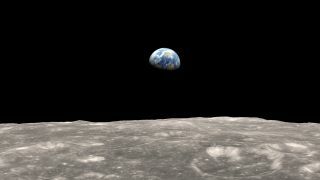 Earth's gravitational pull is so powerful that it creates a small bulge on the surface of the moon. For the first time, scientists have observed this bump from orbit, using NASA satellites. The gravitational tug-of-war between Earth and the moon is enough to stretch both celestial bodies, so they each end up having a slight oval shape, with the tapered ends facing each other. The corresponding distorting effect on the moon, called the lunar body tide, is more difficult to see, because the moon is solid except for a molten core. But Earth's pull raises a small bulge about 20 inches (50 centimeters) from the surface on the near side of the moon and a matching bulge on the far side. "The deformation of the moon due to Earth's pull is very challenging to measure, but learning more about it gives us clues about the interior of the moon," Erwan Mazarico, a scientist who works at NASA’s Goddard Space Flight Center, said in a statement. The same side of the moon always faces Earth, but the bulge does move around a few inches over time, wobbling and following Earth's pull like a magnet, as the moon shifts slightly during its orbit. Scientists observed the lunar body tide using NASA's Lunar Reconnaissance Orbiter satellite, which is mapping the height of features on the moon's surface, and NASA's Gravity Recovery and Interior Laboratory satellite, which is mapping the moon's gravitational field. The satellites measured the height of 350,000 locations spread across areas of the moon closest to Earth and areas of the moon on the opposite side from Earth. The satellites passed over each location several times, so scientists could compare the height of each spot from one satellite pass to the next. By identifying which spots changed height, the researchers could track the lunar tide. Scientists have studied the lunar body tide phenomenon from Earth, but this is the first time satellites have captured images of the lunar tide from orbit. The findings confirm the calculations scientists had already made from ground observations.